LTHForum.com - Rand Red Hots! Hot Dog Heresy! I'm Ready For The Blowback. Rand Red Hots! Hot Dog Heresy! I'm Ready For The Blowback. LTH Home > Chat > Eating Out in Chicagoland > Rand Red Hots! Hot Dog Heresy! I'm Ready For The Blowback. I know what I’m about to say is going to draw a lot of flak. But before you start shaking your interwebs fists, lighting your torches, and digging out your pitchforks from some dark forgotten corner of your toolshed, please read my entire post. Carefully. Twice. I have found a Hot Dog Joint better than Gene & Jude’s. Remember, you promised to read the whole post before reacting. Now, before I go on, let me clarify, I have no ax to grind with G&J. They have never done me wrong (except to deny me—sometimes with a sneer--ketchup for my fries). I have always enjoyed my visits to G&J (except for the absence of ketchup). And I wish them well in their business (seriously, how hard would it be to have a few ketchup packets on hand?). I don’t stand to gain monetarily from this recommendation, nor do I have any personal interest in this place, other than a sincere wish of success for a couple of small businessmen who have figured out how to do something right. 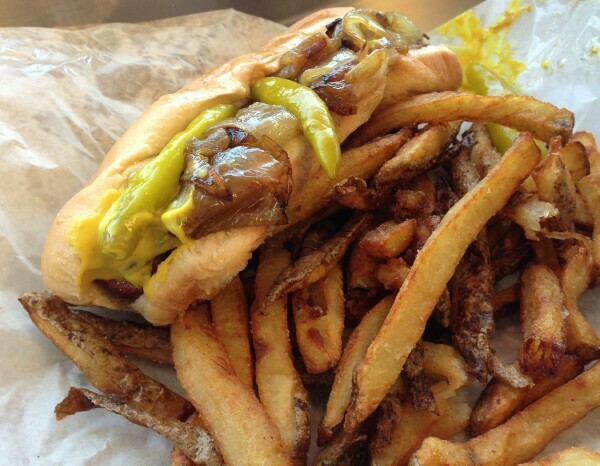 I’m talking about a newish joint called Rand Red Hots, up in Des Plaines. I compare them to Gene & Jude’s mainly because a quick look (and that’s all it takes) at their menu shows a strong influence and perhaps even reverence for their competitors down River Road. That’s it. Other than soft drinks, Shakes(! ), and a couple other frozen dessert items, that’s the menu. Look familiar? How about this: The same topping list (Mustard, Relish, Onions, and Sport Peppers) as Gene & Jude’s, and they wrap the fresh cut fries in with the Dog. Also, I have it on excellent authority that Rand Red Hots is using the exact same Vienna Beef products served at Gene & Jude’s. By now, the smart ones among you must be asking, if it looks almost exactly the same as G&J, what actually makes them better? For starters, there’s the ambiance. The owners of Rand Red Hots took an old, classic Drive-In structure, put a fresh coat of paint on it (vintage 50’s white and baby blue), reorganized the kitchen, and generally revitalized a corner of Rand Road that’s been cursed by bad business for the last twenty years. Next is the food. They may be serving the same Vienna products as G&J, but when you unwrap your Dog at RRH, it isn’t all squished together in an unappetizing mess. The bun retains its original fluffy shape and texture, and the condiments remain close to the Hot Dog instead of half smeared across the wax paper it was wrapped in. 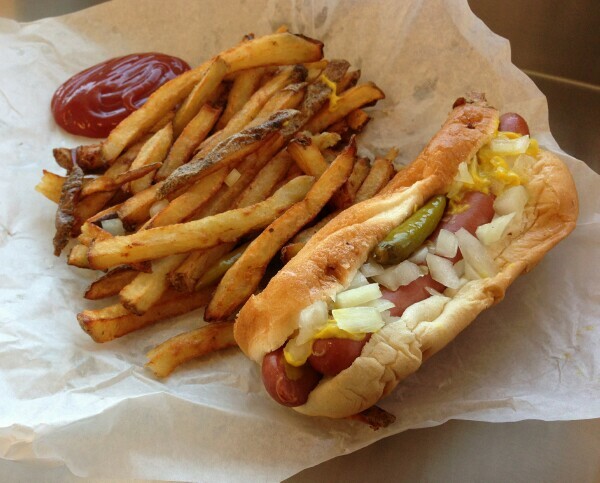 Both the regular Hot Dog and the Char Dog have an appetizing natural casing snap and a good balance of condiments. The difference between the Polish and the Maxwell St. Polish is both in the cooking and the toppings. The standard Polish is steamed, the Maxwell St. version is char-grilled. The standard is topped with the same combination that comes on a Hot Dog with Everything. The Maxwell St. Polish comes with Mustard, Grilled Onions, and Sport Peppers. They’ll happily add or subtract any of those condiments upon request. Personally, I add relish to the mix on my Maxwell St. Polish. Then, there are the fries. Oh those fries. Fresh cut and properly cooked, they are a delight. I can’t think of a single visit to Gene & Jude’s where most of the fries weren’t either undercooked, or had become soggy from their own condensation; wrapped up tight with the Hot Dog. It doesn’t appear that Rand Red Hots is doing anything different with their Fries, and yet their they are; crisp and firm on the outside, light, fluffy, and creamy inside. And, unlike G&J’s fries, when you unwrap them, they aren’t all mashed together in a single clump. And here's the best part: Ketchup for those Fries! Great big squeeze bottles of the stuff, sitting out in plain view and available for anyone to use with impunity! Even the Shakes are good, but not in the same league with Paradise Pup, down the road. My only quibble with the drinks is a .25 charge for a glass of tap water. Other than that Rand Red Hots has fair pricing all around. Admittedly, I haven't tried the Tamales. I guess I should, but I just can’t bring myself to waste precious belly space on a factory made hunk of corn masa, stuffed with low grade beef(?). So now comes the challenge: Before you take me to task for blaspheming against a GNR favorite, make the comparison. Rand Red Hots is on Rand Road, about ¾ of a block west of River Road. Gene & Jude’s is on River Road about 15-20 minutes south. Take the time and visit both of them back to back. Those of you with long memories may recall I offered this same challenge a number of years ago with two well-known Pizza joints. That one turned out pretty good. I have the same faith that you’ll agree with my assessment on this one as well. If not, as I said on that last challenge, I’m a big boy and I can stand the heat. So why are you still sitting there? Go get some Hot Dogs! Last edited by BuddyRoadhouse on February 26th, 2013, 8:53 pm, edited 6 times in total. I gotta ask my usual question... Dark green or radioactive green relish? I wish I'd paid closer attention to the shade of green of the relish, but I was so delirious over having ketchup for my fries, I must have missed that. If I do one of those "relax your mind and be in the moment" exercises, I see proper neon green relish, but I won't swear to that. I'll bet there will be pictures posted here in the very near future answering your question once and for all. @Buddy: Sounds good to me. I can't imagine any hot dog being superior to Gene and Jude's, but I'll definitely give Rand Red Hots a try. I took your Burt's Place challenge a few years ago and you were 100% correctamundo about Burt's being the better pizza over Pequod's. I still firmly believe that Burt's garlic sausage is the best in the business. I just wish he'd put more of it on his pizzas, but that's another topic for some other day. I'll hit Rand Red Hots after Lent. Thank you for the recomendation. Dude, order double sausage. He'll make it any way you want it. I wish G&J served a polish. I have lived a few miles from G&J for close to 20 years now. I've gone there often, but the biggest appeal has mostly been bang for the buck. Until about a year ago, I finally ate one sitting in the car rather than taking it home. It's amazing how much better the fries were. The dog wasn't any different, but huge difference in the fries. Now understand why the parking lot is always full. But in the end, it's still just your typical Vienna hot dog, and a small one at that. I still prefer Gina's in Bensenville more. Better fries, and they have a great deep fried (read healthy!) polish. I tried Rand Red Hots not too long after they opened. I thought it was a good hot dog with great fries. I took the order to go so I didn't ask but I thought it was a skinless dog. Are they now using natural casing dogs? I had dinner at Burt's last week and got tipped off about Rand Redhots by BuddyRaodhouse. I made my first visit a couple days later and since then have been back again. Rand Redhots can, and should, take its place in the pantheon of great Chicago Hot Dog joints serving real traditional natural casing dogs. Just mustard, relish and onions. Sport Peppers on request and ketchup, too, if you must (none of this "drag it trough the garden" crap). They serve their dogs in the same manner of the greats, Gene & Judes, Jimmy's, Red Hot Ranch, 35th Street Dogs, etc., but they've stepped it up a bit in ways that don't compromise what brung them to the table, so to speak. Here's the crew at work. There are a few things to point out. First, apropos of the mother in law discussion, they serve a tamale on a bun (more on the tamales later). They also offer char grilled dogs and polishes, for those who care to blaspheme, as well as grilled onions for their Maxwell St. Polish. You can even order a shake, malt or bottled water and, in the dessert department, ice cream and frozen bananas ("nuts or no nuts"). There have been claims made about "better then Gene & Judes". I don't know about that. It's hard for me to pick a favorite among the few and getting fewer places serving this style of dog. I love them all. I guess the biggest difference between Rand Redhots and G & J's is the fries, which are perfectly cooked and are more akin to the crispy beauties served at Red Hot Ranch than the sometimes mushy fries served at G & J's and Jimmy's. There's room in my tent for all of them, though. It just depends on my mood. Have a look at this double dog (sorry JoelF, no relish on this one). It's a thing of beauty. What more needs to be said. Oh wait, I know what more needs to be said. Let's talk about tamales. Rand Redhots sells the elusive Supreme bunch tamale, by far my favorite form of the corn roll. That makes me a very happy man. For now, Rand Redhots is not very busy, even at lunch time. I suspect that once word gets out that will change, but for now if you don't want to stand in line at Gene & Jude's, drive 10 minutes or so north to get your dog fix. You'll be glad you did. I only wish Rand Redhots was closer to my house so I could visit more often. PreFlopRaise13 wrote: I tried Rand Red Hots not too long after they opened. I thought it was a good hot dog with great fries. I took the order to go so I didn't ask but I thought it was a skinless dog. Are they now using natural casing dogs? Natural casing dogs. Skinless polishes. I also had a bunch tamale. This is my favorite Supreme style as well. It was steamed to the prefect temp and consistency. Time for me to make a return visit! BuddyRoadhouse wrote: They may be serving the same Vienna products as G&J, but when you unwrap your Dog at RRH, it isn’t all squished together in an unappetizing mess. The bun retains its original fluffy shape and texture, and the condiments remain close to the Hot Dog instead of half smeared across the wax paper it was wrapped in. As an occasional visitor to Chicago, this is an integral part of the charm of the G&J dog. For a resident Chicagoan who, presumably, is consuming these delights on at least a weekly basis ( ) I can see how this could go from charm to chagrin. BuddyRoadhouse wrote: I can’t think of a single visit to Gene & Jude’s where most of the fries weren’t either undercooked, or had become soggy from their own condensation; wrapped up tight with the Hot Dog. It doesn’t appear that Rand Red Hots is doing anything different with their Fries, and yet their they are; crisp and firm on the outside, light, fluffy, and creamy inside. And, unlike G&J’s fries, when you unwrap them, they aren’t all mashed together in a single clump. I always dine-in at G&J, unwrapping within 60 seconds of taking possession of the order, resulting in the ideal crispy-creamy characteristics described above. The last time I ordered the fries 'crispy' and, sure, in this ultra-crisp-frite-fad world we live in, I bet people would enjoy them but they were actually too crispy to my liking, no life left in 'em at all. BuddyRoadhouse wrote: Those of you with long memories may recall I offered this same challenge a number of years ago with two well-known Pizza joints. That one turned out pretty good. For those without long memories, or newer LTHers, that was Burt's Place v Pequod's and, yes, that turned out "pretty good"
Is Rand Red Hots better than Gene & Jude's seems a moot point. Is Rand Red Hots serving a near perfect natural casing dog and crisp fresh cut fries, that's the question, and the answer is a resounding Yes! Rand Red Hot double dog with mustard, onion and sport peppers. Rand Red Hots joins Jimmy's, Red Hot Ranch and Gene & Jude's in my natural casing/fresh cut fries rotation. Very, very happy to have this in the neighborhood. I went there for lunch at 1:15, and while not packed, there were people at two of the three counters and both booths (there are some outdoor tables for weather more pleasant than melting snow). Everything about this place was spot on... except the relish isn't neon. It's good, but it's not my beloved radioactive stuff. I wouldn't mind a pickle spear too. But: Crisp fresh-cut fries, snappy dog, corn-mush, cumin-redolent tamales and a nice milkshake with whipped cream $8.18. If nothing else, go for the prices. For $2.99 you get a really good dog and fries. I had to pass by both Photo's and Gyros Factory to get there. Photo's charges $2.69 for a dog without fries, and another $2.09 for foodservice-style (though crisp) fries. Gyros Factory is $2.29 and $1.79 for a very similar dog and fries to Photo's (neither has neon relish). Shakes are $3.00 at RRH, $3.95 at Photos, $1.99/$2.49/$2.99 at GF (a bargain I somehow have managed not to take advantage of). Tamales are $1.50 at RRH, unavailable at Photo's, $1.59 at GF. So taken together, it's about $11 at Photo's without a tamale, for what was $8 at Rand (with tax). Sue, if you're reading this, I know I shouldn't be eating lunch out so often. I had to find out. For the community. I was wondering what the hours are for Rand Red Hots. They don't show them on their website. Their listing on Yelp says 11-10 daily; can anyone confirm this? JoelF wrote: I wouldn't mind a pickle spear too. "If you want that crap, go to Poochie's", as Jimmy said to me upon making a similar request on my very first visit to his namesake hot dog stand. nsxtasy wrote: I was wondering what the hours are for Rand Red Hots. They don't show them on their website. Their listing on Yelp says 11-10 daily; can anyone confirm this? Wait..I mean...are those pics are the same dog? Good eye, same dog. I had the double dog, Steve, who had previously been to Rand Red Hots, had a polish and bunch tamales. Rand Red Hots has become a regular stop for me. I realized I never posted a picture of a "regular" single hot dog, so here's the one I had on my latest visit. This extremely fine example of dogdom was accompanied on this occasion by a decent chocolate malt. The best fully loaded Chicago dog I've had was from Poochie's. The big difference is that they take a lot of care to get the proportions right, so you get a little of everything in every bite, and it doesn't spill ingredients everywhere. Why more stands don't do this is beyond me. For an old-school dog with onions, peppers and mustard, my favorite is Redhot Ranch in Bucktown. I'll have to get out to Rand Red Hots to compare the two. Dang, I pass Redhot Ranch all the time! OK, time for an old-skool dog run at some point. But...I do like the fully loaded dawg, and it is true that Poochie's has the 'proportionalizing' of the condiments down to an art form, to the point that I can tell them 'everything, no peppers, easy raw, easy relish', and it'll be exactly what I want. Poochie's doesn't slather. I loved the Rand Red Hots, and I'm glad Buddy turned me on to it. I'm also a big Poochies fan from WAAY back in the day, esp for the char salami sandwich Oh. My. G.
I like Dear Franks up in Deerfield too- esp their fries which are fresh cut and they fry darker than most places and serve w Merkt cheddar. And if we're talking fries, the Al's beef in Niles has a corner of my heart, too. I have not yet been to Rand Red Hots, but I'm looking forward to trying it one of these days. You might be interested to know that one of the owners is the son of the owner of Bob-O's (not sure whether the son is also a part owner of Bob-O's), a place that oddly (and sadly) receives very little attention on this forum because they serve as good freshly cut fries as you'll find in Chicago (although I'll admit I was once a critic of them), excellent dogs, and very good beef. Purists may cry, but I also love their cheesy beef served on garlic bread. Cell phone photo sent to me yesterday showed a lot of water surrounding it but couldn't tell how deep. I expect Paradise Pup and Las Asadas have experienced the same. Roads for all still closed. T Comp wrote: Cell phone photo sent to me yesterday showed a lot of water surrounding it but couldn't tell how deep. I expect Paradise Pup and Las Asadas have experienced the same. Roads for all still closed. A few of us are supposed to having lunch at Paradise Pup next Thursday, I'm hoping for the best. My & Mrs Sweet Willie's comment as well ! Glad to have RRH in my hood. Another recent visit to Rand Red Hots just confirms that they are solidly in the top tier of hot dog joints serving traditional minimalist hot dogs. As always, the dog had a nice snap to it, the fries were perfectly fried, and the fact that I can get a Supreme bunch tamale chaser is just icing on the cake. I made it to newly minted GNR Rand Red Hots this weekend and was less than impressed. I had a char-dog that wasn't, which came with a nice-sized portion of limp fries. It's just a dog and fries, but based on the praise in this thread, I was hoping for a little more attention to detail. Meh. RAB wrote: I made it to newly minted GNR Rand Red Hots this weekend and was less than impressed. I had a char-dog that wasn't, which came with a nice-sized portion of limp fries. It's just a dog and fries, but based on the praise in this thread, I was hoping for a little more attention to detail. Meh. My one trip here did not impress me, either. I showed up at about 4 pm and ended up with a mushy dog, limp french fries and bun without poppy seeds. Yeah, it was an off hour but I never suffer those issues at Redhot Ranch or Gene & Jude's when I show up at those places at off hours. It didn't stand out as exceptional for me in any way.